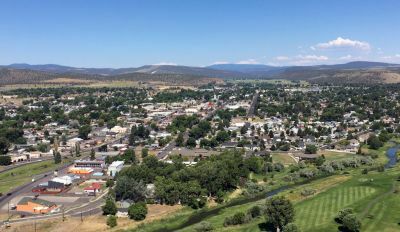 PRINEVILLE, OR -- The Department of Environmental Quality is giving Prineville $10,000 to clean its air. The city's Planning Director Joshua Smith tells KBND News, "90% of the time, our air is very good. There's a few times a year when we get inversions in the winter, that kick us over the limit. In the wintertime, there is a strong argument that it's caused by woodstoves. But, we're also in a caldera here in Prineville, so we get a lot of smoke from outside the community." Smith says they've gotten smaller grants from the DEQ in recent years, and that has helped educate the public about how smoke from wood stoves impacts the community, "In an inversion, if you have a separate heat source, please use it. We recognize that not everyone's going to have that ability. It's expensive to run your electric heaters and maybe it's your only heat source- wood stoves. It's not about eliminating the burning of wood stoves, it's really more of a voluntary action." The DEQ limit for particulates in the air is 35; Prineville has scored higher, but since it began working with the DEQ, Smith says they've managed to stay below the limit, "We've controlled our outdoor burning quite a bit now, really ramped up that level; and the DEQ has provided us a grant to do a lot more cleanup and yard debris days. And since we started that in 2015, we've seen our numbers drop significantly." The city has a new "call before you burn" number that Smith says appears to be helping, as well, "We're actually under the line. We're just trying to stay under the line." The new grant will go toward public awareness initiatives about outdoor burning, more signage, and the addition of yard debris disposal days.